In early 2016, the Ghost Inside drummer Andrew Tkaczyk lost his leg following a fatal bus crash, in which he also fractured his ribs, spine and hip among other injuries. The band's road to recovery is still ongoing, and Tkaczyk is now looking to get back to playing at full strength with the help of some clever engineering. 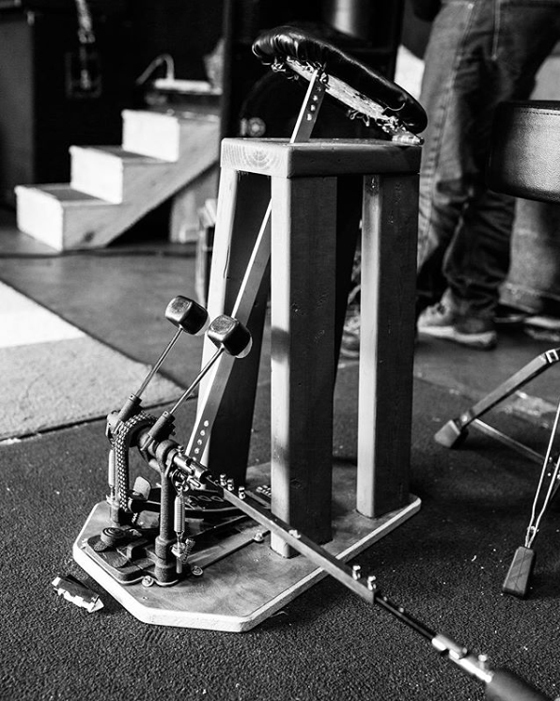 On the band's Instagram account, Tkaczyk shared an image of a device built to serve as an extension of his bass drum pedal. The device, lovingly dubbed "The Hammer" by Tkaczyk's mother, was built by his father to eliminate the need to play drums with his prosthetic leg. "Playing drums with a prosthetic leg just wasn't working out. The timing was way too off. There was a latency. It was awkward and clunky," Tkaczyk explained in the caption. "This way there is no weight my limb has to lift which eliminates fatigue, and gives me a FAR better action when striking the pedal." Tkaczyk added that he still has "a long way to go before I get it 100% down, but it's absolutely the right direction to go in terms of playing as close to my full potential as possible!" In an Instagram post on April 30, the band revealed that "there is a future for [the Ghost Inside]. We still aren't exactly what it looks like. It might be one show, it might be a few shows. It could be a new song or a whole new record. Our journey into that future is just beginning, and we will bring everyone that is interested along with us." Each Monday will see a different member control the band's Instagram account to provide updates and insight on their personal progress following the crash. Find Tkaczyk and the band's posts below. This is something I've been excited to share for a very long time. My Dad is quite the handy-man, and came up with this great idea. Playing drums with a prosthetic leg just wasn't working out. The timing was way too off. There was a latency. It was awkward and clunky. My Dad had a vision of designing me a device where I didn't need to attach my prosthesis at all. This way there is no weight my limb has to lift which eliminates fatigue, and gives me a FAR better action when striking the pedal. With that said, I still have a long way to go before I get it 100% down, but it's absolutely the right direction to go in terms of playing as close to my full potential as possible! My Mom coined the name for this device so we've been calling it "The Hammer" 🔨 Going to stream live here on Instagram within the next hour so come hang out! This is The Ghost Inside 2018. We weren't always sure we would make it here. All along we've said 'let's just get in a room with instruments and see what happens'. Andrew gave us 4 clicks and we sailed off into Between the Lines. Over the next few hours we hacked our way through a dozen or so songs, one at a time. Everything is different. Fingers and feet and throats that have played these songs a thousand times don't operate on autopilot anymore. But there was something special, something beautiful, in doing the thing we love by sheer force of will. Spending a week together as bandmates answered the question that has been on all of our minds - yes there is a future for TGI. We still aren't sure exactly what it looks like. It might be one show, it might be a few shows. It could be a new song or a whole new record. Our journey into that future is just beginning, and we will bring everyone that is interested along with us. Every Monday, one band member will take over all of our social media to give you insight and updates on their personal progress, as well as glimpses behind the scenes of what we are doing as The Ghost Inside as this new chapter unfolds. We know that this is a new normal but hey, the same old thing gets boring right? Thanks for proving that you are the Tried and True.